Quite a few people in the yard of his home put a sidewalk tile. This is no accident. It gives the yard a refined look. 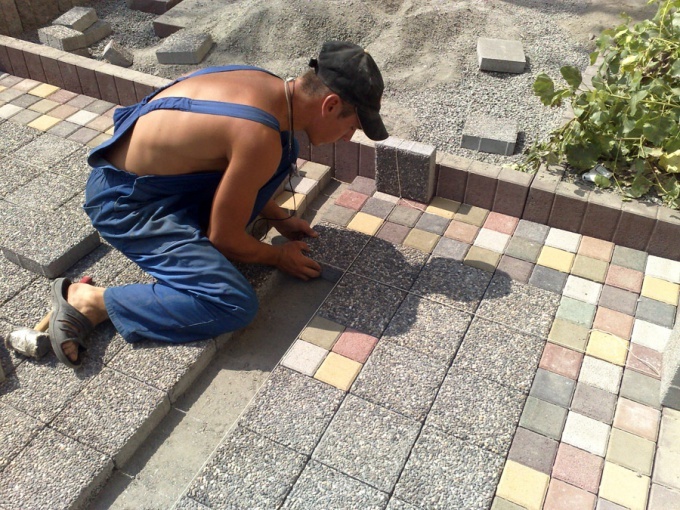 Besides, laying of paving tiles is not difficult. You only need to familiarize with the technology of masonry. Paving slabs laid on sand, gravel or concrete. Conditions of the road surface depends on the substrate type and the thickness of the tiles. Thus the load of the race car can withstand a tile that has a concrete strength greater than 600 kg/cm2 and a thickness of 30-45 mm. The tile must be laid on dry mix or mortar bed, made in the ballast cushion. Tiles, having a thickness of over 45 mm, which is laid on a concrete base that can withstand the weight of the truck. Laying paving slabs. To start doing the excavation of soil at approximately 150 millimeters in depth. Also carry out longitudinal and transverse layout of the cover section. Be sure to consider the slopes for water drainage. On with the plot runs soil compaction. The most common ways to do this - tamping, rolling, vibrating packing. For curbs shall be made for the excavation of the soil. Produce compaction of the bottom of the grooves for side of the stone. In the groove poured a layer of sand about 5 inches. Further side stone set in grooves on the concrete pad. If you are on a weak heaving of the soil that perform the spreading and the area of geotextile. This helps prevent deformation of pavements. Then poured cover the surface of fine gravel. Gravel is poured and tamped. When laying paving slabs, which has a thickness more than 60 mm, poured on top of the gravel layer, the moistened sand with a thickness of about 50 millimeters. Align it with Reiki. How to put trotanoy tiles: the styling methods ↑. Will look like laid out with paving the tracks and platforms on the site solely depends on your imagination and skill, because even the same elements can be used in different variations. In this article we will explain how to lay paving slabs. Technology of laying of such material quite easy. First, you need to choose the paving tiles. After the dry mixture is aligned, you can begin laying the paving. First you need to pull a cord to chamfer the tiles. This cord should lay out the first row. Subsequent rows should be laid so that they adhere properly to the previous one.